Advances in Developing Human Resources (ADHR) focuses on the issues that help you work more effectively in human resource development. The journal spans the realms of performance, learning, and integrity within an organizational context. Balancing theory and practice, each Issue of the journal is devoted to a different topic central to the development of human resources. ADHR has covered subjects as wide-ranging and vital as performance improvement, action learning, on-the-job training, informal learning, how HRD relates to the new global economy, leadership, and the philosophical foundations of HRD practice. Each Issue of ADHR focuses on a single topic of importance to HRD professionals. Special guest editors propose a thematic emphasis for each issue. Experts in their specific fields, they receive papers from some of the most noted professionals in HRD today. Each special Issue is comprehensive yet concise, giving full coverage to each specific subject area. ADHR is easy to read and is highly relevant to both scholars and practitioners. Dealing with the demands of the global economy a diverse workforce can be difficult. From ethics to on-the-job training, from leadership development to action learning to cultural competence, ADHR gives you a quick, easy-to-use reference on each area important in your practice. Complete your library of HRD literature with the comprehensive coverage in ADHR – the essential tool for human resource development specialists. Each issue of Advances in Developing Human Resources is also available for course adoption or for use in a training environment. Multiple quantity discounts apply. Contact Customer Service toll-free at 1-800-818-7243 for more information. Advances in Developing Human Resources is a quarterly journal whose single issues explore and examine discrete topics. These single issues (or "back issues," once the subsequent issue is published) are available individually or in quantities for use in a classroom or training environment. Balancing practice, theory, and readability, each issue is devoted to important and timely topics related to the development of human resources. The content of the journal spans the realms of performance, learning, and integrity within an organizational context. Readable and relevant to practitioners, each issue is grounded in sound research and theory and edited by a top scholar in the field. Research to Practice: ADHR focuses on the issues that help you work more effectively in human resource development. The journal spans the realms of performance, learning, and integrity within an organizational context. Balancing theory and practice, each Issue of the journal is devoted to a different topic central to the development of human resources. ADHR has covered subjects as wide-ranging and vital as performance improvement, action learning, on-the-job training, informal learning, work-life balance, career development and HRD, leadership, and the philosophical foundations of HRD practice. Current and Concise: Each Issue of ADHR focuses on a single topic of importance to HRD professionals. Special guest editors lead each Issue. Experts in their specific fields, they coordinate papers from some of the most noted professionals in HRD today. Each special Issue is comprehensive yet concise, giving full coverage to each specific subject area. Dynamic and Relevant: ADHR is easy to read and is highly relevant to both scholars and practitioners. Dealing with the demands of the global economy a diverse workforce can be difficult. From ethics to on-the-job training, from leadership development to action learning to cultural competence, ADHR gives you a quick, easy-to-use reference on each area important in your practice. Complete your library of HRD literature with the comprehensive coverage in ADHR – the essential tool for human resource development specialists. Each Issue of Advances in Developing Human Resources is available for course adoption or for use in a training environment. Multiple quantity discounts apply. Each Issue of ADHR focuses on a significant problem or timely Issue related to the development of human resources in organizations and the larger society in which HRD functions. Issue Editors and article authors need to speak clearly and confidently about the theory, research, and best practices in a voice that can be understood by the greatest number of readers. While ADHR does not always report new research, what is reported must be grounded in and consistent with the best and latest research. Organization of the Special Issue. It is preferred that special Issues of ADHR be structured around problems, but this is not a requirement. Innovation in the content and organization of the monograph is encouraged. Short pullouts or sidebar stories or illustrations are also encouraged to break up the text and reading. Editor and author bios (with full contact information for all contributors). Please do not include this information with each article description. Instead, include it as an appendix in the proposal document. Approximately 145 double-spaced manuscript pages or 45,000-50,000 words. Adherence to the American Psychological Association style requirements (6th Edition). Table of contents for the complete Issue. Preface can be by the Issue editor, a team of authors, or a guest author. Individual authors (including Issue editor) can appear on no more than two articles, including the Editorial (Preface). Abstract for each article (not to exceed 150 words). Four or five “Keywords” that describe each article. Author bios of 60-75 words included at end of each article. Manuscript Preparation. Manuscripts should be prepared using the APA Style Guide (Sixth Edition). All pages must be typed, double-spaced (including references, footnotes, and endnotes). Text must be in 12-point Times Roman. Block quotes may be single-spaced. Must include margins of 1inch on all the four sides and number all pages sequentially. IMPORTANT NOTE: To encourage a faster production process of your article, you are requested to closely adhere to the points above for references. Otherwise, it will entail a long process of solving copyeditor’s queries and may directly affect the publication time of your article. In case of any question, please contact the journal editor. IMPORTANT: PERMISSION - The author(s) are responsible for securing permission to reproduce all copyrighted figures or materials before they are published in(journal acronym). A copy of the written permission must be included with the manuscript submission. Potential for advancement of HRD theory. Potential for advancement of HRD practice. Fit with the original purpose of the article and the special Issue. Note: Authors who want to refine the use of English in their manuscripts might consider utilizing the services of SPi, a non-affiliated company that offers Professional Editing Services to authors of journal articles in the areas of science, technology, medicine or the social sciences. SPi specializes in editing and correcting English-language manuscripts written by authors with a primary language other than English. 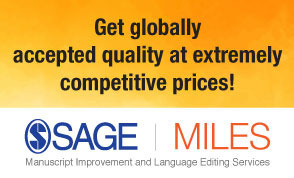 Visit http://www.prof-editing.com for more information about SPi's Professional Editing Services, pricing and turn-around times, or to obtain a free quote or submit a manuscript for language polishing. Please be aware that SAGE has no affiliation with SPi and makes no endorsement of the company. Your use of their services in no way guarantees that your submission will ultimately be accepted. Any arrangement you enter into will be exclusively between yourself and SPi, and any costs incurred are the sole responsibility of the author. The Issue Editor is responsible for overseeing revision and final editing of all articles in the Issue. Once the final manuscript is submitted, it will go through standard copy editing and page proofs that will be sent to the Issue Editor and Editor-in-Chief. Issue Editors are responsible for communicating with authors about edits and gaining their approvals as needed. To view a further note to ADHR issue editors, please click here.